It’s not exactly a secret that I loathe the current crop of pickup trucks. The so-called mid-sized trucks are too damn big, and absolutely overkill for a huge percentage of truck buyers. The average truck these days is bigger than the apartment I grew up in, and probably a lot more comfortable. The current Ford F450 is approximately 11,000 feet long, for example. Think about how much more maneuverable that truck would be without that giant pesky hood up front. The time for Cabovers is now. Given our nation’s obsession with pickups, it’s clear that they aren’t going away any time soon. So maybe it’s time for a rethink on what truck buyers actually need. Trucks keep increasing in size because every generation has to beat the previous generation on payload capacity with a larger bed. A larger bed means a larger cab, means stiffer suspension and a more powerful engine. Manufacturers are in a towing capacity arms race, and nobody really benefits. Does any civilian really need to be able to tow 21,000 pounds, or put 7000 pounds of stuff in the bed? Most folks, like myself, need a truck for odd jobs around the house, runs to Home Depot, and maybe the twice-a-year boat tow to the lake. I don’t necessarily need to put super heavy things in the bed, but many larger lightweight things. I need to be able to haul long wood posts or sheets of ply-board, maybe a cute rug for the dining room. The same premise exists in civilian trucks as well. With the cab of the truck taking up the same section of wheelbase as the engine, you can have a more capable and easier to drive pickup. When you are sitting on the nose of the truck, you can see exactly where the nose is during tight maneuverability moments. People like to say that they like trucks because they sit up higher and can see farther ahead down the road. Sitting on top of a big turbodiesel V8 will give you that elevation you so desire. It’s the perfect idea. Truck lovers rejoice. 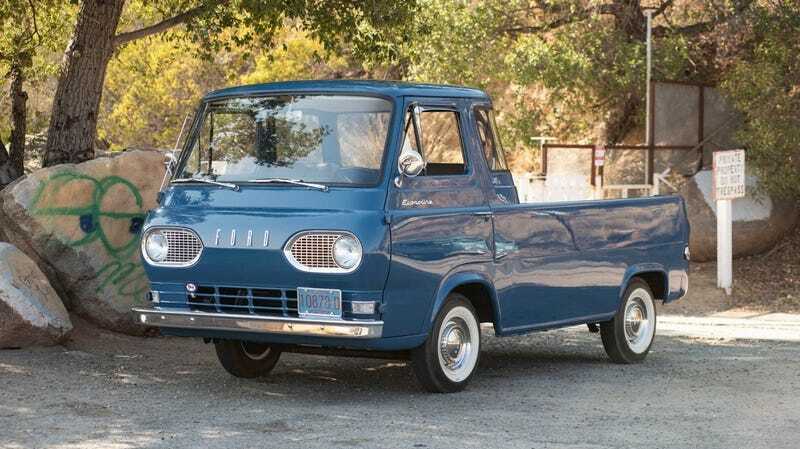 Besides, this Econoline-based pickup is essentially still a van, and it’s always Van Time. The example shown here can be found on eBay, if you’ve been convinced by my arguments.